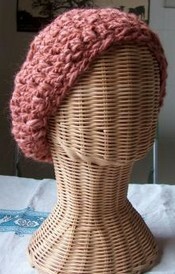 Here’s a lovely soft tam beret pattern to crochet for yourself or as a gift. Worsted weight yarn and an H hook produces a small child’s hat size, but the sample was done with a 8.00mm hook and bulky yarn. by the talented designer at CreativeYarn of creativeyarn.blogspot.com and CreativeYarn on Etsy. At the end of each round join with a sl st in 3rd ch of beg. ch 3. Rnd 6: ch 3, 1 dc in each next 2 dc,*1 dc in next ch 2 space, 3 dc in next 3 dc*, repeat from * around ending with 1 dc in last ch 2 space and joining to first dc.